If your business works with highly sensitive information that requires consistent disposal, we have the perfect solution. Rated the highest in the industry, the machines in this line are rated either 5 or 6 on the security scale depending on which model you choose. This line is backed by the brands that do it best in this industry: HSM, Fellowes, Swingline, Dahle, Desroyit, and more. Don't worry about your organizations important data getting into the wrong hands again with this high powered, high volume line. Take a look at the selections below. This is MyBinding video. 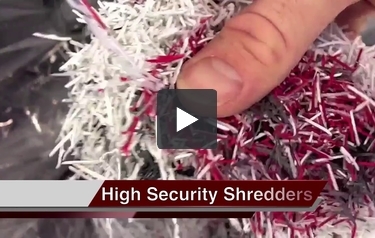 If you’re looking for a high-security level five or six cross cut or micro cut shredder, you’re home free. Since security and privacy is so important nowadays, there are plenty of shredders on the market that can handle the most sensitive of documents. They can be rather pricey but what’s the price of security? We carry a variety of manufacturers, such as GBC, MBM, Dahli, HSM, Fellowes and many more. Whether it’s a large amount or small amount of shredding that you need at a high level, we have what you need. If you have any questions at all, our customer service is proud to answer the phone and walk you through whatever you might need. When image matters, MyBinding.